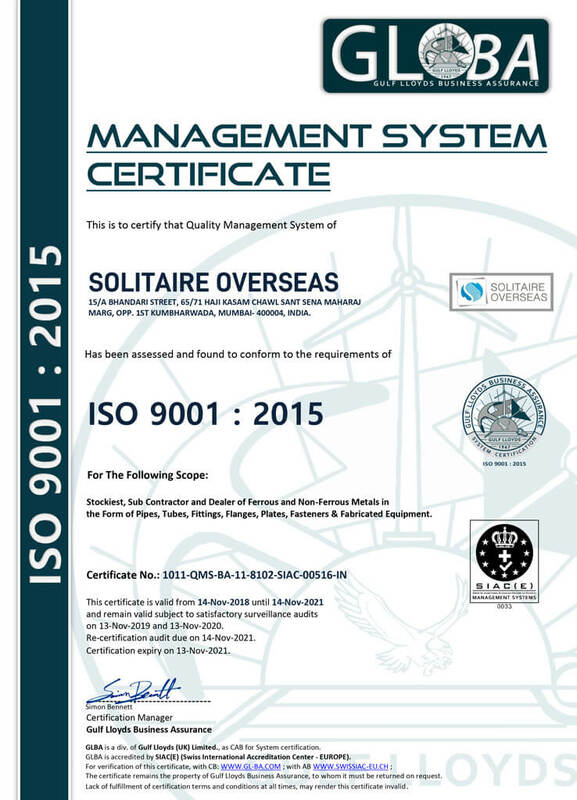 Solitaire Overseas is a proud Exporter & supplier of industrial Raw materials & Process Equipment to Fortune 500 Companies of India and all the renowned Public Sector Units of the country. In addition to this, it is the only supplier which is registered with all the Ministry of Defence Companies. The Company’s internationalization can be judged through exports of materials to Global clients like Kuwait National Petroleum Corporation, Kuwait Oil Company, Qatar Petroleum, Qatar Petrochemical Company, NATIONAL IRANIAN OIL REFINERY (NIOC), MEW- Kuwait etc. It has established a niche for other industries to tread the path of quality service to their clients. SOLITAIRE OVERSEAS IS ONE OF INDIA’S LEADING STOCKIST ,MANUFACTURER , SUPPLIER AND EXPORTER OF METAL TAPERED PLUGS & THREADED TAPERED PLUGS. Mumbai – 400004 , India .